You can always find the list of current event round up on BigKidSmallCity.com… but here are some unique things you could do any day of the year… but may not always remember to do! This list does not include usual favorites… so you won’t find the awesome Children’s Museum here. Instead, you will find things with fewer crowds, some that are a little quirky, and all that are just as much fun as the well-known spots. Below you will find: Restaurants, Parks, All-Time (Unusual) Favorites & Experiences. Check the links for holiday hours… and get to exploring! 1. Black Walnut at Conroe North Houston Regional Airport – This is the restaurant where you can watch planes and helicopters land… right next to your table! See the pictures HERE! 2. Maryam’s Cafe – This coffee shop/restaurant is like an old antique store where you can order coffee, juices, smoothies, ice cream, breakfast or lunch… and in the back there is a playroom for kids! The only trouble with it is, how do you decide between playing in the back or sitting in the thrones (yes, king and queen thrones) in the front window? 3. The Dunlavy – As you walk up the stairs, you find yourself at tree height and the huge windows on 3 sides of the dining room let you feel the outdoors. The dining room is the most beautiful room we have seen this year. 4. Niko Nikos at Market Square Park – This is a Greek café where you order at the window and take your food to the patio. You can order breakfast, lunch or dinner, coffee and alcohol. There is a kid menu and a giant park for kids to run through. Market Square Park is an open space and it is easy to watch your kids from the pergola covered patio! 1. Donovan Park – This wooden fortress is one of Houston’s coolest playgrounds. Train, castles, ropes, bridges and more at Donovan Park! 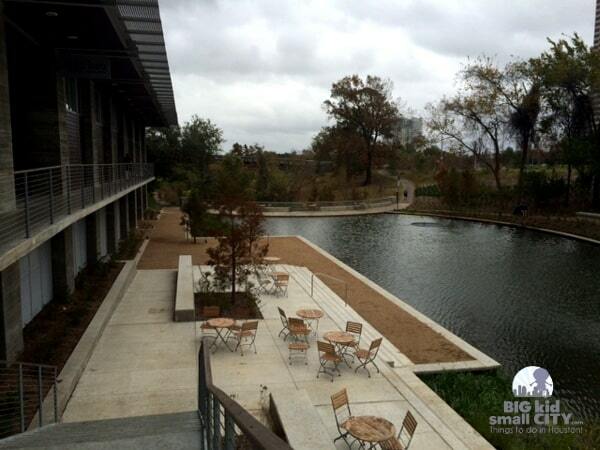 This is not a Houston public park… and was built by the Houston Heights Association. The sign at the park and the website says it’s for all kids to enjoy. See the pictures HERE! 2. 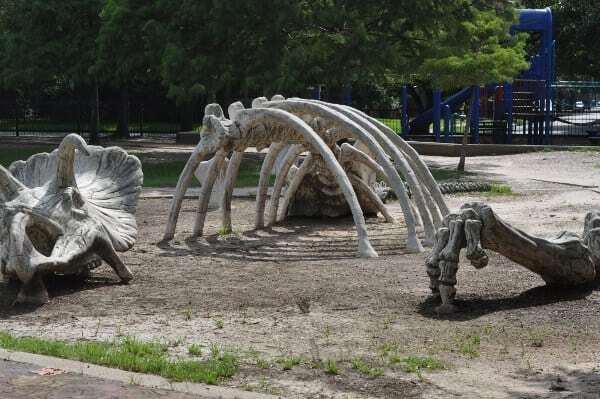 Travis Spark Park – This Houston park was designed by kids… and has dinosaur bones, a rock wall and very cool play structure. Travis Spark Park is in the Houston Heights and is open to the public on evenings, weekends and holidays. See the pictures HERE! 3. Jaycee Park – Not far from the popular Donovan Park and Travis Spark Park is the cool and unique Jaycee Park! There are the usual slides and ladders… but there are also loops for scaling across the play structure, music stations, a rope bridge, curving rock wall, spring-loaded seesaws, a bumpy slide, a fireman pole, a stand-up swing that you go around and around on… and that’s just the start of it. See the pictures HERE! 4. Barbara Fish Daniel Nature Play Area at Buffalo Bayou Park – Right along Buffalo Bayou, next to the Lee and Joe Jamail Skatepark is the Barbara Fish Daniel Nature Play Area at Buffalo Bayou Park! Not only does it have a slide, climbing structures, water features and drums build in to the landscape, but this park has an amazing view of the downtown skyline, access to the Buffalo Bayou trails, has free parking, new restrooms at the Water Works building… and a newly uncovered historic cistern. You need to see the pictures HERE! Also, very close by in the Buffalo Bayou Park is the Waugh Bat Colony and at dusk you can see hundreds of thousands of bats emerge! 5. Fire Truck Park – When Southside’s first fire truck was retired in 1970, it was kept in this park, making it the Fire Truck Park. This truck and the other playground equipment came into disrepair after many years of use, so in 2012, a completely renovated Fire Truck Park was opened. And it is fantastic. For kids under 5 years old, there is a new fire truck play structure. All around the new fire truck is unique equipment, for big kids, that you do not you see at every Houston park. The merry-go-round is made from a tire, there are little “flowers” where the kids sit and spin themselves and there is a very unusual rock wall for the biggest kids. 1. Mysterious Red Button on Buffalo Bayou – Have you heard about the Big Bubble in the Buffalo Bayou? Have you seen the mysterious red button on the Preston Street Bridge? A friend told us that their 5 year old’s favorite thing to do in Houston was to, “burp the bayou”, and we just had to know what this meant. 2. Update: The Observation Deck is NOW CLOSED to the public. JP Morgan Chase Tower Observation Deck – The JP Morgan Chase Building is 75 stories tall, making it the tallest building in Houston and one of the tallest buildings in the United States. The observation deck is on the 60th floor. 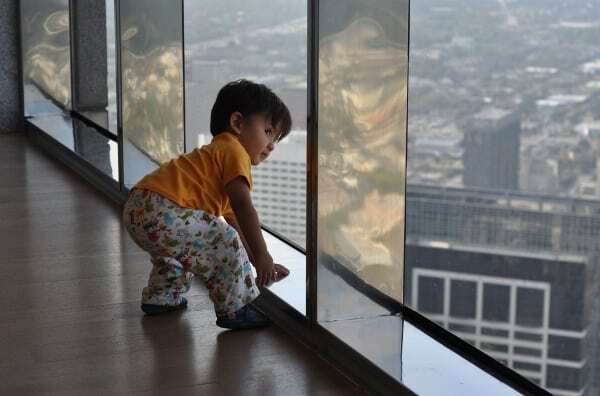 During business hours, Monday through Friday, 8:00am to 5:00pm, this observation deck is open to the public for free. 3. Caninos Market & El Bolillo – Visit Canino’s Produce Market and be amazed by the cases of pastries at El Bolillo! 4. Art Car Museum – This funky museum is small and free. Stop by with the kids while you are in the Houston Heights! 5. Orange Show and Smither Park – Experience art so unique you can only find it at a monument celebrating oranges. Visit the Orange Show and then picnic at Smither Park! 6. Beer Can House – When you drive up, you think you’re in just any residential neighborhood until you see a shiny silver house with beer can chimes blowing in the wind. 7. Mounted Patrol Stables – Visiting the Houston Police Departments Mounted Patrol Stables might just be the coolest free thing to do in Houston. Bring your own carrots, quartered apples and peppermints, and you can stop in to visit the horses, during visiting hours. Bring a giant bag of carrots… like the ones you get a Costco… because there are nearly 40 hungry horses to feed! 8. Waugh Bridge Bat Colony – Each night at dusk, watch hundreds of thousands of bats emerge in the middle of the city! 1. 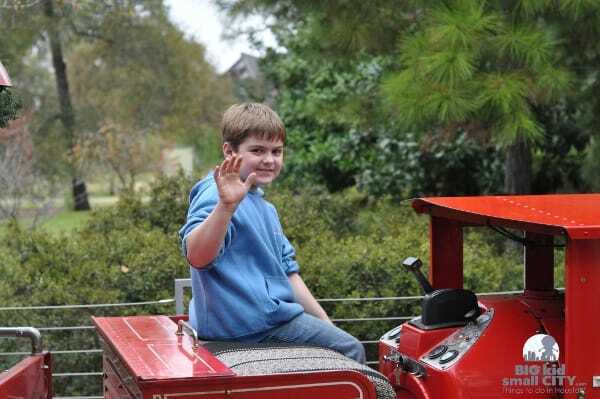 Engineer for a Day – My son counted the days until he was 7 years old and could be Engineer for a Day at Hermann Park. Now 8 years old, he asked to drive the train again as his Christmas gift. Engineer for a Day is a pretty cool experience. So cool, that my 6 year old girl is now counting down the days until she turns 7 and can be the Engineer. Kids arrive in the morning and help open up the train barn, perform safety checks, wash the train and get the railroad ready for the day. After about an hour of preparations, they sit right next to the conductor and help take the train around to Kinder Station. Read more about it… and see the pictures HERE! 2. Feed the Giraffes – At the Houston Zoo, the Giraffe Feeding Platform opens to guests. You can walk up the ramp, so you are eye level with the animals, and feed them dinner. For $5 $7, you can buy 3 pieces of lettuce. 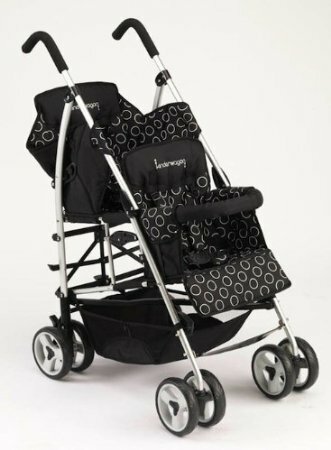 Use a 3 for 1 person, or share them between kids. It might seem like a lot of money for a little lettuce, but when you get face to face with the Masai giraffe family, and see their cute faces and long black tongues, you might just change your mind. When you buy your lettuce at Giraffe Exhibit, ask for a frequent feeding card. When you fill it up, you’ll get to feed the giraffes for free! Once you are done feeding the giants, visit the Swap Shop. You can bring in things you found in nature, earn points, and swap for something new. Learn all about it HERE! 3. Eat Bugs – At the Cockrell Butterfly Center inside the Houston Museum of Natural Science, you can find lots of butterflies fluttering around, lots of interactive displays on insects… and a vending machine full of bugs. Some are chocolate coated, some are coated in sour cream and onion flavor… and none are something I want to eat. My kids are much braver and enjoy the black ant chocolate cookies. The ants make them crunchy. (Yikes!) If you are bored with the usual Snickers bar, check out the butterfly center! Wherever you go, enjoy the time with your kids! If you are looking for the gear I use for urban Houston exploring, go HERE! And if you are still looking for more fun, check out these suggestions for parking, exploring and eating, all in one stop. Here are over 30 Half-Day in Houston ideas! Half Day in Houston: Go Shopping, then Eat at a Cafe that is Cute Like an Antique Store... and has a Playroom for Families! Jill, this might be the best list you’ve ever made! Thank you! Thanks Raina! I really appreciate it! Wonderful site – so many ideas for my grandson – TY !